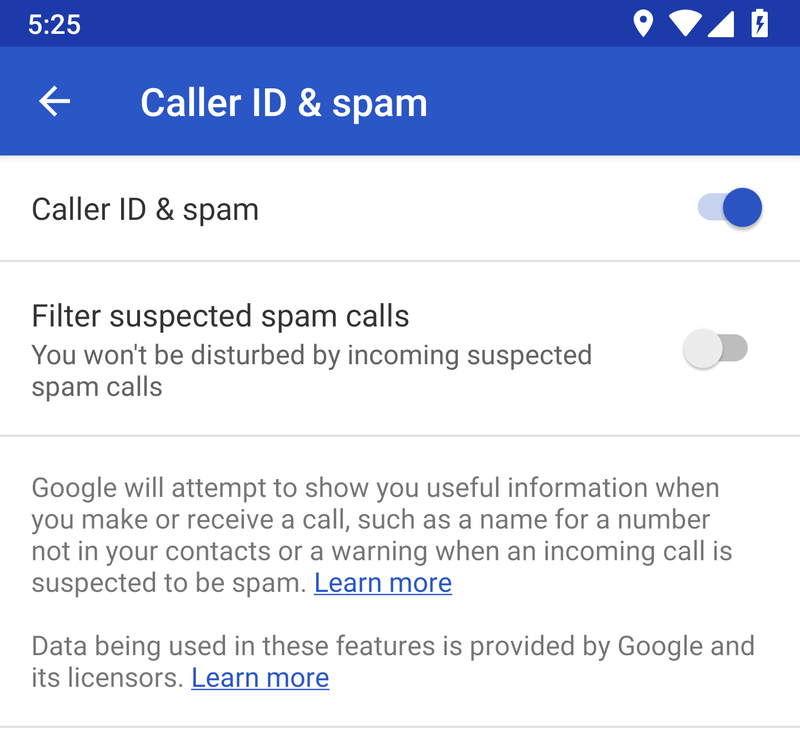 We've all become accustomed to Google apps being in a perpetual state of flux from one UI convention to the next, so it's not too surprising to see the Phone app going through a fairly significant change. 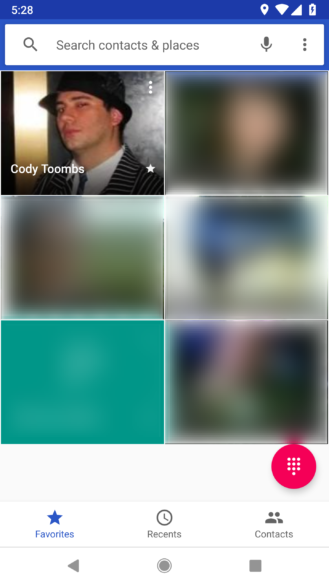 This time, the tabs across the top are being exchanged for the bottom navigation bar that's becoming the new trend across many of Google's apps. This change has been spotted before, but required a bit of modification to trigger it. You'll find the same buttons are in the same order, and they use the same icons, albeit with inverted colors. There are also text labels, just in case you're confused. Also of some note is the button to open the dial pad. 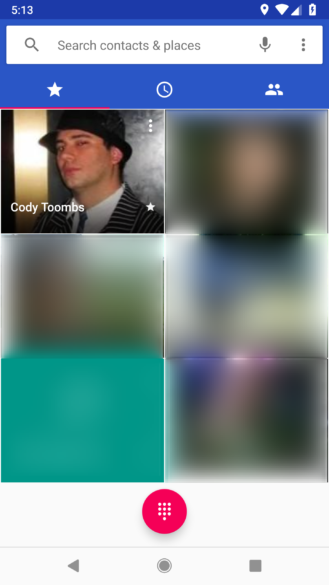 It had a slightly specific behavior where it used to be located centrally while displayed on the Favorites tab, but would then drift to the right side in the Recents and Contacts tabs. Well, that's over. The button will now always live at the bottom-right corner. As for the usefulness of this change, it's probably a mixed bag. On the one hand, you can no longer swipe between tabs like you used to. I don't know how many people used that, but I did it all the time. On the other hand, the navigation buttons are now on the bottom of the screen where they're easier to reach, so the need to swipe is probably not as prevalent. 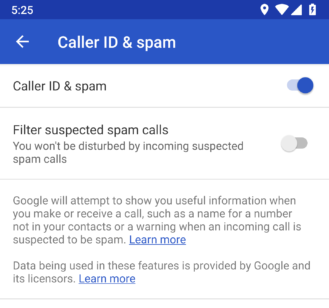 Nearly two years ago, the Google Phone app began displaying a bright red screen when an incoming call appeared to be coming from a likely spam caller. This was only a warning, but it didn't prevent phones from ringing. 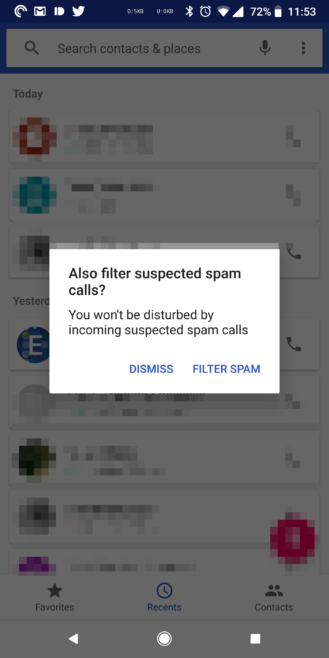 However, we've since seen Google Voice add spam blocking and subscribers to Project Fi may see it at the network level soon enough. But as of the latest update, it's now supported directly in the Phone app. There's not much to it, you simply have to open the Settings screen and look within the caller ID and spam section. A new switch can be used to turn on the filter, after which there shouldn't be any more of those bright red call screens. Unfortunately, this won't solve the problem of illegal number spoofing, so spammy jerks with their pointless junk calls will still get through with fake numbers... Nah, I don't have a chip on my shoulder. To solve that problem, we still need to convince service providers (or more likely the lawmakers) to actually force network level changes that will shut out the bad elements. 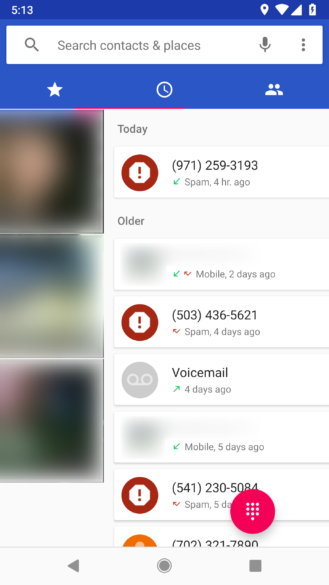 Nevertheless, at least this will cut down on some percentage of the disruptive spam calls. 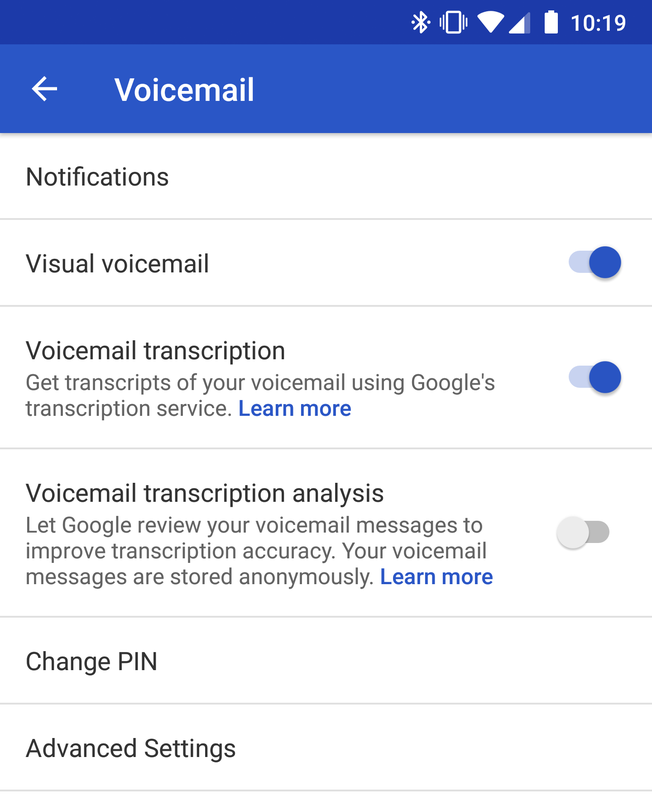 If you're on T-Mobile (and possibly other services to come), the Phone app recently added the ability to get transcriptions without enabling a service like Google Voice. 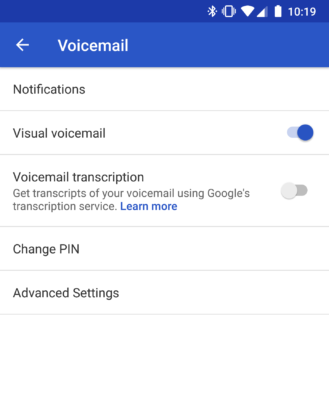 But there was one oversight to the implementation: It couldn't be disabled without also turning off visual voicemail. In the v19 update, this has been corrected with a new option to switch the transcription on or off, and you can also separately opt into donating the voicemail for analysis so Google can further improve accuracy. – Thanks, Richard. I don't really know much about the situation with Sprint's HD Voice feature, which transmits a wider audio range so voices sound more realistic, but it seems like that might not have been supported in some Motorola phones. 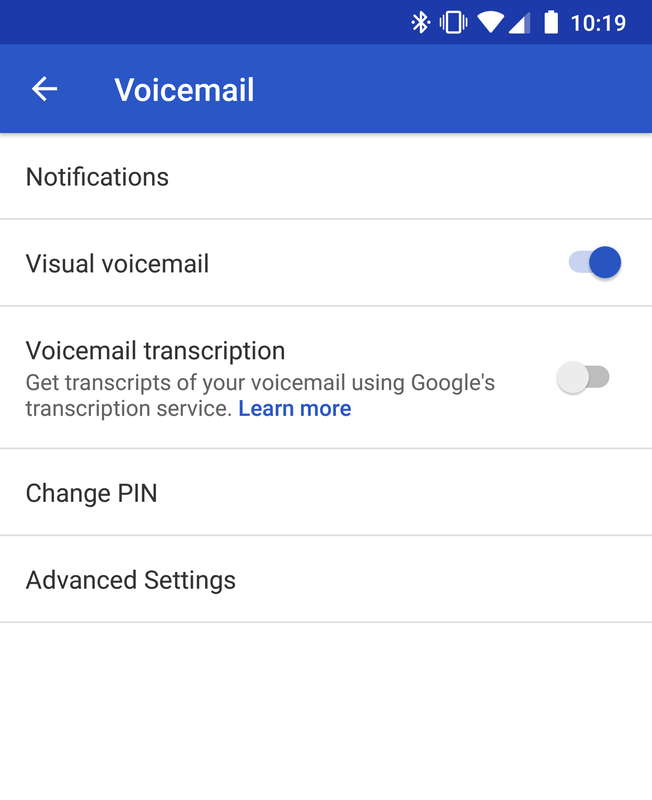 The latest update adds a flag that turns on the HD Voice codec when a phone is connected to Sprint. The flag is triggered with these mobile network codes. Note: The names of networks listed after the codes were added by me, but many of them are likely outdated or outright wrong, but it's the best I could find given various online lists. mcc310-mnc130 North Carolina RSA 3 Cellular Tel. Co.
mcc311-mnc450 Panhandle Telecommunication Systems Inc. If you're making a call with a dual-SIM phone, you've possibly been prompted to select which SIM you'd like to use. The text for that has been updated, but more importantly, there may also be a new option to remember which SIM was chosen for the future. I don't have any dual-SIM phones to test with, but this may already be live. Support for RTT is getting closer to launch, and with the latest update, two more lines were added. One is a status message callers will see when they're waiting for a member of the call to answer, and the other is a simple button label recipients will see when an RTT call comes in.